The IEA energy statistics underestimates the role of wind and solar in the world’s energy mix – by a factor of three. Here’s why. The answer is well hidden in an error made in a 12-year-old Statistical Manual by the IEA and OECD. As wind and solar continue their growth, this will soon need to be changed. After correction, it will become apparent that wind and solar energy already contribute about three times more to the world’s energy supply than normally reported, and that the shift to renewable energy sources comes much sooner than many decision makers are aware of. When a solar power plant, coal power plant and nuclear power plant all produce the same amount of electricity, one would think that energy statistics would consider these contributions to the world’s energy supply to be relatively similar. Both the nuclear power and coal power are counted threefold relative to the solar power plant, taking into account that about three units of coal or nuclear energy are needed to make one unit of power. A similar loss happens, of course, in a wind farm or solar park, but here the IEA statistics do not make any correction to take into account everything that has been lost. The IEA merely reports the one unit of power produced and neglects that there were also about two units of energy lost in these fossil fuel plants. Consequently, the IEA ends up reporting the world’s use of fossil fuels roughly threefold versus wind and solar, and the actual role of these renewable energy sources becomes greatly underestimated. In a research paper recently submitted for publication (Sauar, 2017), it is documented that this way of counting is contrary to the basic physical energy definitions that the IEA itself states that it follows. A short, popular resume of the reasoning, however, is given below as there is currently limited literature on this topic for policy makers. Primary energy supply is, simply said, the first «raw energy» that enters an engine or power plant and then transforms into «refined energy» or «secondary energy» as, for example, electrical power or mechanical power. For gas, oil and coal, «primary energy supply» is reported correctly today as the number of tons of oil, gas or coal reflect the amount consumed during the year. Whether this is used efficiently or not, is not counted. When the oil is refined and later enters a car engine, for example, most of the energy is lost, and only about 20% of the primary energy excerpted from the oil field is converted into refined, mechanical energy that drives the car forward. For solar power plants and wind turbines, the primary energy is the solar energy that is radiating or the wind energy blowing into the power plant, while the refined energy is the electricity that is being produced. As in the combustion engine, much of the primary energy is lost, but about the same amount is turned into the desired electricity (or mechanical power). So why are these two situations not treated equally and according to the definition of primary energy? Most likely part of the reason is mere simplicity. Companies producing oil or coal count the amount that they extract in tons. Companies producing electricity from solar and wind energy count the amount of electricity they produce. As can be read in the IEA and OECD Statistical Manual (2005), the IEA currently regards the primary energy form as the first energy form downstream in the production process for which multiple energy uses are practical. However, as can be seen in the figure above, this means that most energy sources are counted as primary energy, while some others (hydro, wind and solar) are counted as secondary energy. This is hence not a counting method which will count the well-defined term primary energy. It will probably instead count something that could be named «tradable energy». A second problem is that the current method counts a primary energy source 100% according to its primary energy content only if it goes through an interim heat production process. This is particularly problematic since the interim production of heat is frequently not the most energy efficient route for converting a primary energy source to secondary energy. Nearly 50% of the thermodynamic potential to perform energy work (the potential electricity) from a chemical energy source (like oil and gas) is immediately lost when converting it to heat. Oil and natural gas can in principle be converted to nearly 100% electricity in a perfect fuel cell. After these energy sources are converted to interim heat, however, they have lost nearly 50% of their potential to make electricity due to fundamental thermodynamic principles. Solar panels, on the other hand, are lower in efficiency, but will soon be around 20% on average, and would need a factor in the range of 5.0 in order to account for the losses. This last factor may appear high, but the losses in the conversion of solar energy to secondary energy are actually fairly similar to the losses of oil based energy prior to and inside a combustion engine. For a 60/40 mix of wind and solar, the average accounting factor would be around 3.3, which is very much in line with how biomass and nuclear is treated. Voters, industry leaders and politicians do not make their decisions based on objective facts, but on how they perceive and understand them. That is why perception matters. If a marathon runner knows he is about to win, he will put in more effort. If an industrial company knows that the market will prefer what they produce over the next 25 years, then it is easier to invest. Politics obviously also is an «art of the possible». Hence, it matters very much what politicians believe is possible. A relevant and contemporary example can be found in today’s political discussion in Norway, where the oil industry is arguing for opening more areas for oil exploration. One of their main arguments (latest used on VGTV August 15, 2017 by leader of the Norwegian Oil and Gas Association, Karl Eirik Schjøtt-Pedersen) is that the world needs more energy and that the new renewables are not mature yet to step up as they account for only 2% of the energy supply. A correct reporting by the IEA would clearly change this perspective and weaken or remove this argument. That again is likely to impact what decisions voters and politicians will make. To the left is the energy supply reported by the IEA in their annual World Energy Outlook 2016 for this scenario. To the right is the same graph, but showing the primary energy consumption as the metric also for wind and solar energy. It is worth noting in the graph above that on the left side nuclear power appears to play the same role as the combination of wind and solar in 2040. However, this is a pure artefact of today’s IEA counting since the amount of power produced from wind and solar is foreseen to be a lot larger than that from nuclear in 2040. This is hidden in today’s reporting, but becomes very clear when wind and solar energy is correctly accounted for. For voters and politicians considering whether or not they should stimulate wind and solar energy it is likewise very discouraging to see that even after 25 years of stimulation for solar and wind energy, the fossil energy sources are still dominating. Such perceptions can easily lead to hopelessness and passivity. A correct illustration of the actual importance of wind and solar energy relative to the others is hence of high and practical value. It matters. In the introduction, we looked at energy used for power production. However, a lot of energy, oil in particular, is used for transportation purposes. There is currently a beginning mass supply of electric vehicles combined with strong growth in wind and solar energy. This development is particularly relevant because electric vehicles are a very good way to store the intermittent energy from wind and solar power plants. It is also particularly relevant because there are normally significant losses when converting any energy source to electricity or usable mechanical energy. For wind and solar energy, this conversion loss occurs at the power plant. For the oil based energy, this conversion loss occurs in the combustion engine. Let us therefore compare the two value chains conventional-car-based-on-gasoline and electric-car-based-on-a-mix-of-wind-and-solar energy. Ideally, this comparison should be done based on global averages, but these are not always readily available. We have therefore below only presented reasonably representative numbers. A more thorough global study would obviously become more precise, but the result would probably not be radically different. The consumption data for an average gasoline car are for example taken from the US EPA (Thomas, 2017). As can be seen above, the two value chains are actually very comparable in primary energy consumption per kilometre if the actual definition of primary energy is used with a gasoline car consuming 17 MWh per 15 000 km while the electric car on solar power consumes about 15 MWh. Taking into account that the average car in the US may be larger than the average electrical car, the small benefit of the electric car will probably even disappear. The «primary energy error» of current energy statistics thereby has the slightly absurd impact that whenever a car converts from fossil fuels to solar and wind power, the world energy primary consumption appears to fall by 75% even though that is not happening! In many of the toughest climate policy scenarios, they therefore show that the world primary energy consumption is squeezed downwards over the next 20 years, and the reader gets the understanding that this is a tough energy diet to take. But as can be seen above this is simply not true, but an artefact of the current statistical counting method. For the Solar PV technology the IEA counts only the electricity produced, as has been thoroughly explained above. For the Solar CSP technology, however, the IEA counts the interim high temperature heat production and thereby reports it with a 3 times higher primary energy production than solar PV – even when they produce exactly the same amount of electricity from nearly the same amount of solar energy. First and foremost, it must be a clear requirement to international strong-reputed organizations like the IEA that their counting methods are in accordance with the physical entities they aim to count. The IEA may of course argue that they follow the thermal based counting method that they describe in the OECD and IEA Statistical Manual, but this counting method does not count primary energy when it comes to solar and wind power. It counts only the secondary energy made. Another important perspective is, of course, which numbers that give the most relevant perspective on the contribution of the different sources of energy to the world’s energy supply today and in the future. A significant question could be raised if there existed a large energy resource with only 5% energy efficiency as this would quickly appear to be much more relevant than it is. Fortunately, that is not the case. Based on the table above for the transport sector, it should be clear that using the term primary energy correctly also for wind and solar, will give a much more relevant understanding than today’s inconsistent terminology. For the power sector, it is similarly clear. Solar modules will shortly have an efficiency of about 20%, while wind turbines are frequently above 40%. This is not very different from nuclear, biomass and coal power plants, especially when also taking the transport and refinery losses into account prior to the power plants. BP (2016) has realized this problem and therefore recently started to multiply the contributions from wind and solar by a factor of 2.8 in order to better show the actual contribution from wind and solar energy to the world’s energy supply in their scenarios. This factor was chosen in order to take into account the average losses in a fossil fuel power plant, and thereby estimate what amount of fossil fuels that wind and solar replace. In order to account also for all the extraction and transport losses in order to get the oil, coal and gas to the power plant, the conversion factor should probably increase to about 3.1–3.4. Source: EnergiogKlima. Reproduced with permission. You can tell their bias by their use of the “tons oil equivalent” unit. It’s like measuring dietary requirements in mars bars equivalent. …please do not diss the mars bar. A similar thing happens with our utility billing aggregator and reporter. They report that gas is much cheaper than electricity. And gas ends up costing 2 x as much as electricity for the delivered heat. The calculation is for Energy Conversion factors, not Production rates. A mostly meaningless figure for renewble sources anyway. The real problem is the use of “primary energy”, which is a junk measurement. It basically measures waste. More “primary energy” == more waste. What you want to look at is the “final energy” numbers. IEA has been extremely bad about releasing those numbers, historically. The electrical generation numbers, although they’re also showing an intermediate, are closer to final energy numbers and more useful. Let me suggest that there is a different way of looking at the mathematics of replacing fossil fuel energy with renewable energy that might be simpler for people to grasp. 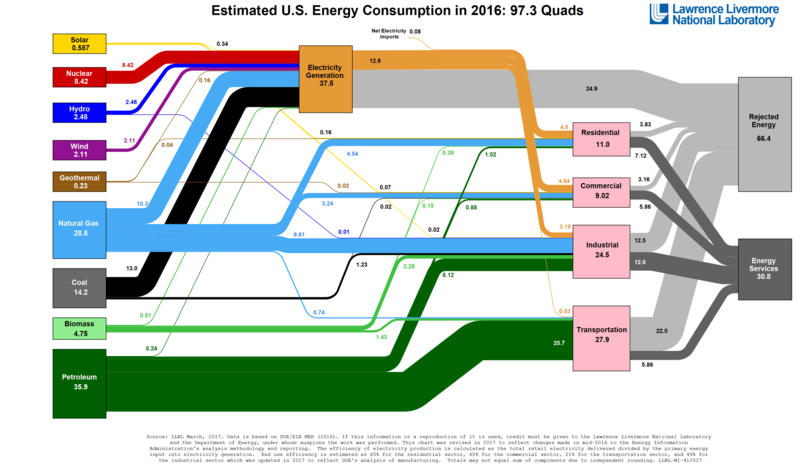 The US Department of Energy publishes annual Primary Energy flow charts. (As do other countries.) Here’s the 2016 chart. On the far left is all the “primary” energy the US used in 2016. Renewables (wind, solar, etc. ), nuclear, and fossil fuels (coal, natural gas and oil). The boxes are sized to represent relative amounts. On the far right are two boxes. Rejected energy and Energy Services. Energy Services is the energy that actually does work we want done. Lights our light bulbs, moves our cars down the road, and smelts aluminum. Rejected energy is what we waste – waste heat. In order to reduce carbon emissions and quit making the global warming problem worse we need to replace fossil fuels with renewable energy. But we don’t need to replace 100% of the energy we get from fossil fuels, only what we use. There’s no need to make massive amounts of unwanted heat. A coal plant might be 40% efficient. Put 100 kWh of energy in the form of coal in the front end, get 40 kWh of usable electricity, send 60 kWh of energy in the form of hot air and steam. To replace that coal plant we need only to generate 40 kWh of clean electricity, not 100 kWh. A gasoline powered car is about 20% efficient. 100 kWh of gasoline in the tank, 20 kWh of kinetic energy moving us down the road, 80 kWh of heat. So much waste heat that we need a special cooling system to keep from melting the engine.